mRUBiS is used in our research projects on Software Engineering for Self-Adaptive Systems, particularly, as the adaptable software to evaluate MORISIA and EUREMA. In the context of the project "Evolution of MDE Settings in Practice" we captured several case studies on how MDE settings look like and evolve in practice. For the development of real-time embedded systems model-based solutions play an important role. Within our laboritory we implemented a tool-chain allowing to develop software for a mobile robot according to the development process in the domain of real-time embedded automotive systems. 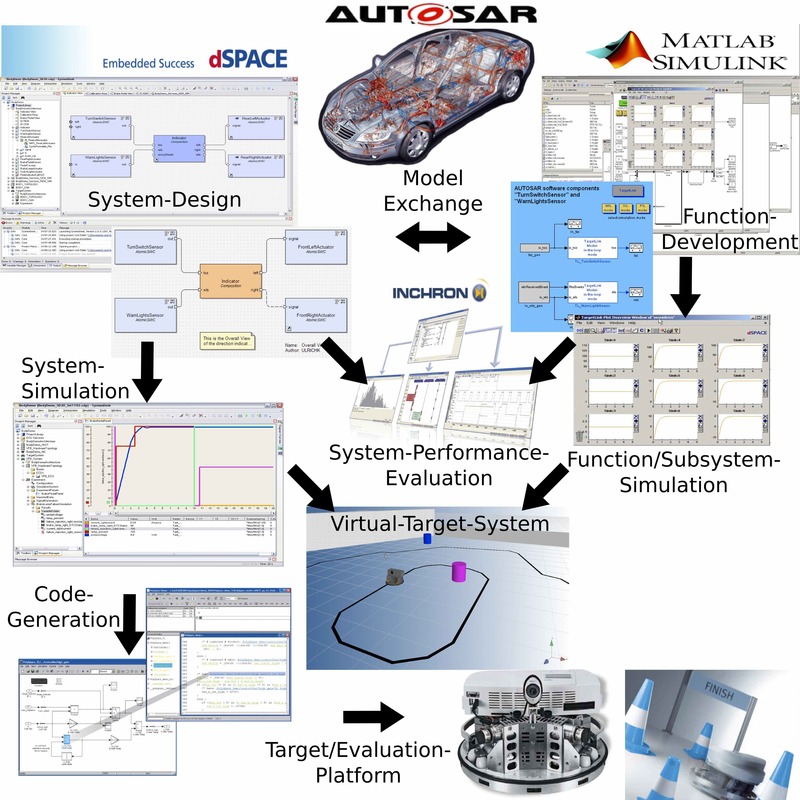 A set of professional tools have been integrated into a tool-chain like in the case of MATLAB/Simulink, SystemDesk or TargetLink for supporting the model-based development of software for mobile robots. The tool-chain supports typical development steps like in the case of MiL (Model-in-the-Loop) and SiL (Software-in-the-Loop) test-phases. Further the setting of the Lab is used to evaluate ongoing research in the domain of embedded real-time systems but also for teaching students the development, validation and verification of such systems. Particular attention is given to so called non-functional system properties like in the case timing. For more information about our Cyber Physical Systems Lab see www.cpslab.de. In cooperation with dSPACE we developed a tool chain that is able to transform SysML models within Eclipse into AUTOSAR conforming models within SystemDesk.